On February 28, Center for Global Sustainability Director Nathan Hultman will provide testimony at a hearing held by the Environmental and Climate Change Subcommittee of the U.S. House of Representatives Energy and Commerce Committee at 10 a.m. on Thursday, February 28, 2019, in the Rayburn House Office Building. Hultman's testimony is as follows. Thank you, Chairman Tonko, Ranking Member Shimkus, and Members of the Subcommittee for inviting me to testify here today on the essential role of subnational actors in an overall comprehensive strategy to set American climate policy on a path toward renewed and reinvigorated leadership. I am Director of the Center for Global Sustainability at the University of Maryland School of Public Policy, and served as a lead author on the recent report Fulfilling America’s Pledge: How States, Cities, and Businesses are Leading the United States to a LowCarbon Future.1 It is an honor to share with the committee my perspective on how the diversity of sub-national efforts in our country is driving progress today and laying the groundwork for an effective, comprehensive American strategy to address climate and economic issues of fundamental importance to our country. 1. The first part answers the essential question of “what does it all add up to?” and describes the significant impact resulting from accelerating subnational climate actions in our country. 2. The second part illustrates how these actions can provide a path to a comprehensive American climate strategy that includes diverse subnational actors as a basis to support and enhance additional progress through new Federal action. 3. The third part underscores how subnational American leadership, combined with a reinvigorated Federal engagement, can catalyze global action—in other words, how we have the opportunity to pioneer new models that fuse subnational with national action, leveraging American leadership to inspire higher levels of climate action across the world. Overall, I argue that despite the challenges to action apparent today, the extraordinary changes we are seeing across the U.S. economy—driven by these many actors stepping up to answer the urgent need—underscores that we can effectively respond to climate change as a country if we harness this momentum and build quickly on it. In recent years, coalitions of subnational actors2 in the United States have formed to reflect and enhance their own communities’ or constituencies’ interest in climate action. Notably, the current U.S. Administration’s announcement of its intent to withdraw from the Paris Agreement generated the fast-growing We Are Still In (WASI) coalition—which now numbers over 3,600 states, cities, businesses, communities of faith, tribal groups, universities, cultural institutions and more.3 Other coalitions of mayors, states, and universities have also emerged, such as the U.S. Climate Alliance4 of states, which after the recent elections now numbers 21 governors of both parties. Taken as a group, these coalitions represent well over half of the U.S. population (173 million people) and nearly 60% of U.S. GDP ($11.4 trillion). And these coalitions are globally significant, representing the equivalent of the world’s third largest economy and the world’s fourth largest greenhouse gas emitter (Figure 1). While the number of actors is large and their overall economic and emissions footprint is significant, a key question is whether the actions from these groups and leaders will make a difference. In other words, “What does it all add up to?” Here it is important to remind ourselves that that our constitutionally based, Federal political system in the United States devolves some policymaking authorities to different levels of government, and that’s the case for some areas affecting climate and energy policies as well. For example, states have considerable scope to affect emissions outcomes through energy policies such as renewable energy targets and building energy efficiency codes, and municipalities also have considerable scope through regional planning and local transportation policies. In addition to this diverse Federal policy space, our free market economy and open political system enables significant decision making authority to companies and other organizations; businesses, for example, can decide to procure renewable electricity or more efficient transportation fleets.5 Our Fulfilling America’s Pledge study estimates that, by utilizing these policy and decision opportunities, existing commitments from subnational actors are already making a significant impact, with additional near-term reductions possible. To understand what that impact is, it’s useful first to set a few baseline points for comparison. One common point of reference is the size of U.S. economy-wide greenhouse gas emissions— including CO2, methane, HFCs, nitrous oxide, and others—which was about 6,500 million tonnes of CO2equivalent (Figure 2) in 2005. Emissions in that year are the baseline against which many current goals are set, including the U.S. Nationally Determined Contribution, otherwise known as our Paris climate target, which sought to reduce U.S. emissions by 26-28% below that 2005 level by 2025. A combination of factors subsequently helped drive emissions down between 2005 and 2016, including Federal energy efficiency, vehicle fuel economy, R&D investment, and electricity sector policies; but that drop also reflects the impacts from earlier subnational policies, market forces, and consumer choices. But absent future policy drivers, looking forward from today, market forces and consumer choices will not be enough to keep U.S. emissions on a downward trajectory, and would fall far short of a pathway consistent with longer term decarbonization trajectories needed to address climate change. As one reference point, absent other drivers, an estimated 18% growth in GDP to 2025, combined estimates for population growth, would result in emissions growth of approximately 3% to 2025, to roughly 6,000 million tonnes of CO2 equivalent. These coalitions are globally significant. Were they a country, they would constitute the world’s third largest economy and fourth largest emitter. Source: Fulfilling America’s Pledge. It’s in this context that the contribution from subnational actors today is so important. Without Federal action, they are the major remaining drivers for continued reductions in U.S. emissions, and the impact is significant: existing commitments from subnational actors in the United States—those that are already on the books today—are estimated to turn that 3% growth in emissions into a 17% reduction below 2005 levels by 2025, roughly 2/3 of the way to our Paris target. And while they are in that sense extraordinarily helpful, those existing commitments alone are nevertheless not sufficient to get the United States fully back on track towards a long-term trajectory consistent with science-driven climate goals, such as keeping global temperature increase to well below 2 degrees C. And because of this, many of these actors are expanding their policies and stepping up to do more. This includes new leadership entering after the mid-term elections that has already pledged to take more action on climate in their regions and states, and more broadly includes the growing awareness and engagement across the country. We estimate that using the tools available to them in the near term, states, cities, and businesses over the next couple of years could actually drive U.S. emissions close to (though not quite reaching) the U.S. Paris target for 2025. Such actions could include more rapid expansion of renewables, reductions in methane leakage, accelerated coal power retirements, and a variety of other approaches across sectors. Our estimate is that this broader engagement, within realistic constraints, could reduce emissions by more than 24 percent below 2005 levels by 2025 — within striking distance of the Paris target. scenarios but would have the ability to drive additional reductions to 2025 and beyond. Source: Fulfilling America’s Pledge. Third, and essentially, the work of subnational actors to implement more ambitious climate actions provides a basis for accelerating economy-wide climate action in the future. The Fulfilling America’s Pledge study estimates that subnational actions can deliver accelerating emissions reductions across the U.S. economy: Compared to the recent rate of reductions of 1.1% per year, we estimate roughly 1.6% per year between 2016–2025; and after 2025, the rate accelerates further to roughly 2.1% per year. This rate is close to the roughly 2.3% annually needed to bring the U.S. to deep decarbonization by midcentury6 (Figure 3) to be consistent with long-term climate goals. The key, currently missing element here will be broad engagement by the U.S. Federal government, via both the Congressional and Executive branches. Notably, even though it is not on its own sufficient, the work that subnational actors have been driving energetically over recent years was always going to be a necessary part of any comprehensive American climate strategy and would have needed to happen at the levels we are now seeing at some point soon, and in this sense we are ahead of many other countries in the breadth of engagement at the subnational level. Subnational actions are therefore not only helping to deliver real reductions. They are laying groundwork for faster action later, under an essential, comprehensive approach that includes the significant policy authorities of the U.S. Federal government. Figure 3. Long term vision for the U.S. emissions trajectory consistent with climate goals of limiting global temperature increase to 2°C or below. Solid line shows historical U.S. emissions to 2015; dashed line shows pathway to the U.S. Nationally Determined Contribution under the Paris Agreement, and dotted line shows a linear pathway to deep decarbonization by mid-century. Achieving this pathway would require a roughly 2.3% reduction annually. While this is greater than subnational actors alone can deliver, importantly, their actions can drive decarbonization of 1.6%- 2.1% per year upon which Federal actions can build. Source:United States Mid-Century Strategy for Deep Decarbonization. In addition to reducing emissions and building the groundwork for future action, there is a third way in which the work being done in the United States has the potential to impact climate outcomes, and that is through influencing international actions. This next year will see the beginning of a major movement by countries around the world to reassess their own national levels of ambition in light of the science as well as their own progress. It will also represent an opportunity for countries to integrate the increasing amount of non-state, subnational, and regional collaborative action happening in their own jurisdictions to enable them to scope a higher level of ambition. This action is happening globally, just as in the United States. 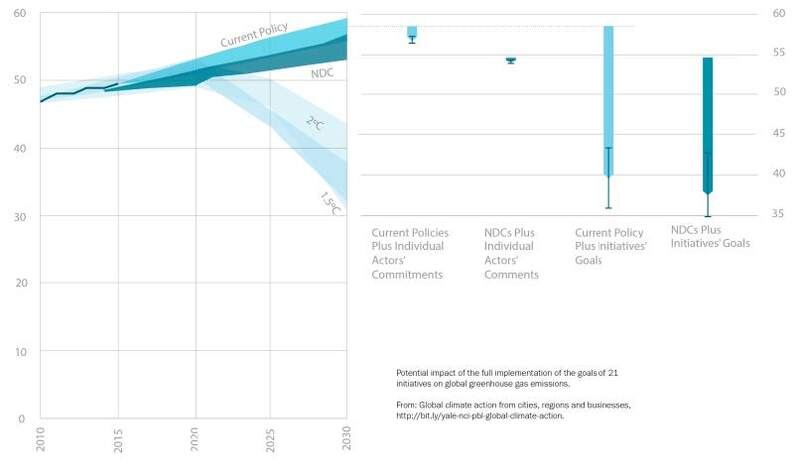 A recent UNEP Emissions Gap report7 estimates that more than 7,000 cities from 133 countries, 245 regions from 42 countries, and 6,000 companies with at least $36 trillion in revenue have pledged action on climate. And while there is no global study that carries out estimates of impact directly comparable to those presented earlier for the United States, another recent study8 estimated that by 2030, subnational or regional commitments to climate action could reduce global emissions by 1,500 to 2,200 million tonnes of CO2 equivalent per year compared to what would be achieved through existing national policies (Figure 4). Figure 4. Estimates of additional global impact from subnational and non-Federal/non-state actors demonstrate the significant reductions that could result from collaborative actions and initiatives across countries. Source: Data Driven Yale, NewClimate Institute, Netherlands Environmental Assessment Agency (PBL). In this context, subnational action in the United States has importance for the international community in at least two ways. First, the fact that American subnational actors are still making significant progress in reducing our own emissions is an important signal to countries that the U.S. is still remaining engaged and delivering real change, despite the lack of Federal engagement. Our subnational actors are demonstrating American leadership through the substantial extent of continuing climate action for the global community. In this area, U.S. global leadership matters. We are the world’s second largest emitter and arguably the country looked to most for leadership in the context of the international approach to climate change. What we do here in many ways sets the tone for the level of climate action globally, and this in turn can lower—or raise—the chances of success in addressing this immediate and growing challenge. And while there is no direct substitute for national leadership, the recent subnational actions we are discussing today do in fact support other countries’ ambition by demonstrating that the U.S. is both delivering reductions now and as a result is more likely to be able to re-establish a rapid path toward deeper decarbonization. Second, the scale of the climate challenge will require a broad adaptation of the model of diversified climate action across all governance levels and economic sectors that we have seen blossom in the United States in recent years. Our own experience here, innovating on new policies and institutional approaches, can provide a testbed for others looking to engage more broadly across their jurisdictions and national situations. In summary, we have seen a rapid groundswell of climate action over recent years, with leadership from all corners of America—including governors and state legislatures, mayors and city councils, counties, businesses and investors, communities of faith, tribal leaders, universities, health care organizations, cultural institutions, and private citizens. Even without the Federal government, they have outlined steps that they see as beneficial for their constituencies, having evaluated the benefits that action can bring in the form of economic transformation and reducing risks to their communities, and have chosen to take steps to move toward a cleaner future. These actions are already making a difference today; they will generate benefits in the near term; and they will likely accelerate as momentum for action grows. In doing so, they have also helped create the conditions for strong Federal answer to their own climate leadership. 2 There is no universally agreed terminology for the diverse group of states, cities, businesses, etc. that are taking climate action. Some partially overlapping terms in current use include “sub-national actors”, “non-Party actors”, “non-state actors”, “real economy actors”, and “non-federal actors”. To reflect the framing of this hearing, I use the term “sub-national actors” in this document, noting that some of the actors who have made commitments or are taking action may not fit perfectly in this category (for example, multi-national corporations). 3 Further details of the We Are Still coalition are available at https://www.wearestillin.com. 4 Further details of the U.S. Climate Alliance are available at https://www.usclimatealliance.org. 5 As one example, RE100 is a global coalition of major companies committed to 100% renewable power. Further details are at http://there100.org. 8 Data Driven Yale, NewClimate Institute, PBL 2018: Global climate action of regions, states and businesses. Research report published by Data Driven Yale, NewClimate Institute, PBL Netherlands Environmental Assessment Agency, prepared by project team of Angel Hsu, Amy Weinfurter, Andrew Feierman, Yihao Xie, Zhi Yi Yeo, Katharina Lütkehermöller, Takeshi Kuramochi, Swithin Lui, Niklas Höhne, Mark Roelfsema. Available at http://bit.ly/yale-nci-pbl-glob- al-climate-action. On Thursday, February 28, at 10am, you can watch a livestream of the hearing on the House Committee on Energy and Commerce website.